Sometimes there's not much to say about a film that's sat in your heart since you were very short indeed. You can make all the critical arguments for or against it that you like, but the fact remains that no such to or fro will have any effect -- and so it is for me with Frank Oz's horror-musical Little Shop of Horrors. 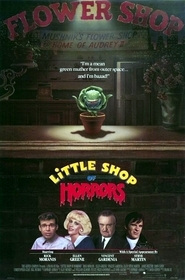 Based on the Off-Broadway musical of the same name (which in turn is based on the 1960 Roger Corman cheapie of the same name), Little Shop of Horrors follows the fortunes of Seymour Krelborn (Rick Moranis), Skid Row florist's assistant, sweet fella, and complete schmuck. Seymour dreams of escaping his confining existence and running away with a fellow employee, the drippy Audrey (Ellen Greene, reprising her stage role). Fate hands him a bizarre and peculiar plant, which he calls the Audrey II. The uniqueness of his Venus Flytrap on steroids draws in the crowds and the money, but there's a terrible price to pay for success, as Seymour will learn all too well. Little Shop is an ambitious film to be sure -- the sprawling Skid Row set took up every square inch of Pinewood Studios' "007" set, at the time the largest in the world. The puppet for Audrey II (or puppets, to be precise, as there were several) is a marvel to behold and its movement is for the most part effective and real -- one is almost never removed from the reality of the story. This is made more amazing by the fact that Audrey II had to be shot at 12-16 frames per second, so actors that shared a shot with it were often forced to lip synch in slow motion. 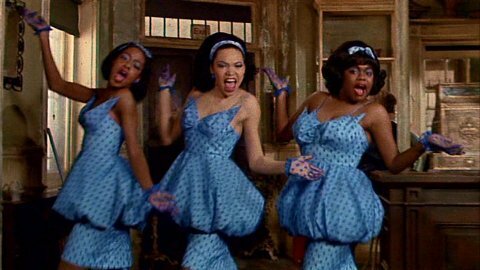 The funky Greek Chorus in Little Shop of Horrors (1986). The songs are extremely good for singalongs -- they just have that bouncy, memorable feel to them. For that, we can thank Howard Ashman and Alan Menken, a duo who would later go to pen the tunes for Disney's "The Little Mermaid" and "Beauty and the Beast." After years of watching Little Shop ad nauseam as a child, I am gifted with a (nearly) perfect memory of the lyrics for "Suddenly Seymour" (a sweet ballad, until you remember that one of the participants just chopped the other one's boyfriend into bits) and "Dentist" (a rebel's ode to orthodontia). Sadly, certain numbers from the stage musical, including "Mushnik and Son" and the extended version of "The Meek Shall Inherit" don't make the cut, but given the near-perfect pacing of the film, these are minor complaints. What has always sold the film for me, however, is the joyful irony of Seymour's character arc. Here's a little runt of a guy who just wants to go on to something better, but is so lacking backbone to do anything about it that he willingly takes abuse from his sarcastic employer Mr. Mushnik (Vincent Gardenia). With the success of Audrey II, he's no more happy, even once all of his life's obstacles are eliminated (always through laissez faire -- Seymour's too passive to actually do the dirty work himself). The price is too high and it gets higher every day. From a simple desire to rise above his means comes death and destruction, all because he relied on something easy. It's that slippery slope known all too well by visitors to the Twilight Zone and it always ends badly. Well, almost always. The single serious flaw in Little Shop of Horrors is the ending. An ending was filmed where Audrey II kills everyone and takes over the world, but test audiences rejected it. Oz filmed a brand-new ending where Seymour heroically faces off against the plant-monster, who sings "Mean Green Mother From Outer Space," an original number written expressly for the film. The finale feels like a cheat, given all that had transpired up to that point. Still, there's something to be said for the horror-musical. 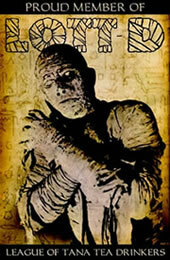 It takes a genre that calls forth primal fears and swirls it in with another that elicits primal joys. Done improperly, such a mixture would certainly be an unmitigated disaster. Put it together the right way, like Oz does with Little Shop, and you have a delicious melange of dark ironies that should be savored as often as possible. Looking for the legendary apocalyptic alternate ending? Good luck. While it appeared as a special feature on the original 1998 Special Edition DVD, producer David Geffen had the disc pulled and the footage removed, in anticipation of a re-edited theatrical re-release that never materialized.